Chateau Magdelaine dates back to at least the 18th century when it was owned by the Chatonnet family. 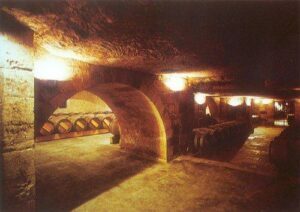 By the early 1950’s, Magdelaine had fallen into a state of neglect in the wine making facilities and their Saint Emilion vineyards. At that point, the estate was put up for sale. It was acquired in 1952 by Ets Jean-Pierre Moueix who replanted the vineyards and modernized the wine making. Chateau Magdelaine is an old school styled, traditionally made Bordeaux wine is located just outside of the village St. Emilion. Chateau Magdelaine has some very good neighbors. The property is situated close to Chateau Ausone, Chateau Belair-Monange and Chateau Canon at the break of the limestone plateau. Even though this Bordeaux wine is produced almost exclusively from Merlot, Magdelaine is not fleshy or lush in style. It is a lean, light, fresh, bright, stern, classic style of Saint Emilion wine. The 11.3 hectare St. Emilion vineyard of Chateau Magdelaine is planted to 90% Merlot and 10% Cabernet Franc. The terroir is limestone and clay soil. The vineyard is one large parcel, with a terroir that can be divided into two sections, with 6 hectares located on the Saint Emilion limestone plateau while the remainder of the vines are planted on the slopes. Most of the vines are close to 35 years of age. However the oldest plots of Magdelaine date back to the 1920’s! The vine density is 6,000 vines per hectare. For the production of Chateau Magdelaine, two laser sorting tables have been in use since 2009. The winery uses thermoregulated concrete vats and since 2004, they have also some stainless tanks for the fermentation. No bleedings take place and malolactic fermentation occurs in tank. The decision to add the press wine is made during the elevage. Chateau Magdelaine is aged in an average of 40% new, French oak barrels for about 18 months before bottling The production of Chateau Magdelaine is close to 2,500 cases per year. There is a second wine, Les Songes de Magdelaine. Chateau Magdelaine is better with at least 5-10 years of bottle age. Of course that can vary slightly, depending on the vintage. Chateau Magdelaine is best enjoyed in the first 7-25 years of life. However that is vintage dependent as a recently tasted 1928 was sublime! Chateau Magdelaine is best served at 15.5 degrees Celsius, 60 degrees Fahrenheit.Chateau Magdelaine is best paired with all types of classic meat dishes, veal, pork, beef, lamb, duck, game, roast chicken, roasted, braised and grilled dishes. Chateau Magdelaine is also good when matched with Asian dishes, hearty fish courses like tuna, mushrooms and pasta. 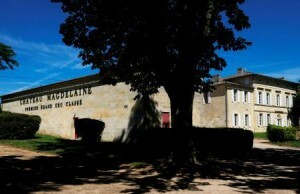 When the 2012 St. Emilion Classification was announced, the owners of Chateau Magdelaine, Ets. Moueix, declared that 2011 would be the final vintage for the property. From that point forward, the vineyard of Chateau Magdelaine would be merged into their other estate in the appellation, Chateau Belair-Monange. Medium bodied, stony and fresh, the mineral driven nose is complicated by notes of thyme, black cherry, earth and plums. Clearly there is more held in reserve that should come out with 5-7 years of age. Showing some lightness in the color, the wine is maturing. More interesting on the nose with its black raspberry, floral, tobacco and earthy character, than on the medium bodied, crisp, bright, red berry and herbal finish. Medium bodied, the wine is more interesting on the earthy, floral, cherry and spice centric nose, than on the palate, with its fresh, bright, red fruit character. Earth, herbs, floral and spicy cherry notes, medium body with a crisp, cherry finish. The wine is fine, it just lacks excitment or unique character. Bland and light, this fully mature, lean, St. Emilion wine was focused on red berries, tobacco and spice. Fully mature, there is no reason to hold this any longer. Just past its best days, the wine is medium bodied, fresh, bright, crisp and offers up red plums, cherry, flowers and earthy notes. Soft and gentle in texture, a bit light in the mouth, this is more than ready. Austere, with slightly rustic tannins, the wine is on the very bright, red berry side, with nuances of herbs, wet earth and spice. Medium bodied, with sharp, red fruits in the finish, this is an old school classic. I was surprised at how good this wine was. At 90 years of age, there was a lot to like here. Looking like an orange tea, the wine had depth of flavor with cigar box, leaf, herb and cedar notes to go along with the bright fruit. Soft and refined, the finish felt as fine as it tasted.